maybe it can now lead the way in paperless and profitable journalism. In a black day for good journalism, it was announced today that the print edition of one of the country’s finest newspapers, The Independent, is to close. The Independent is one of the world’s first newspapers – but unlikely to be the last – to buckle under the intense pressure and competition of the internet. The paper will disappear from the newsstands next month. 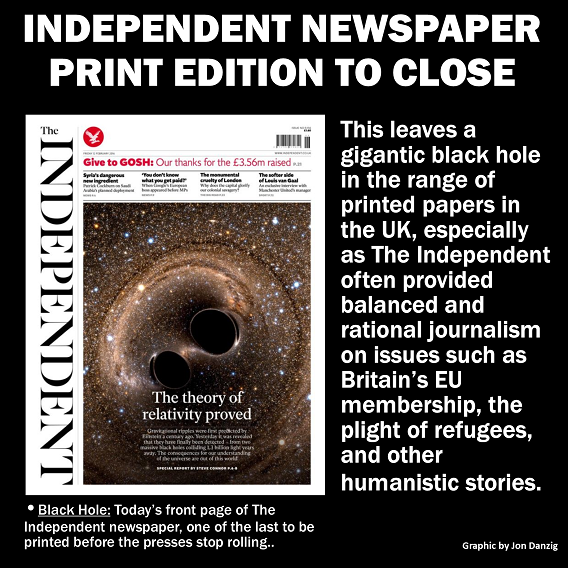 This leaves a gigantic black hole in the range of printed papers in the UK, especially as The Independent often provided balanced and rational journalism on issues such a Britain's EU membership, the plight of refugees, and other humanistic stories. “Today’s announcement realises the worst fears of staff on the Independent and Independent on Sunday. To close these historic titles overnight after a deal clinched behind closed doors, without any consultation or attempts to engage with staff, demonstrates the contempt the company has for its workforce. “The fact that our national newspapers can be shut down overnight with no scrutiny and no ability for their future to be secured through other means, underlines the moral bankruptcy of newspaper ownership in the UK. That needs to be urgently addressed. The NUJ will do all it can to support all members affected." The Indy, as it’s affectionately known, built a reputation for publishing radically different stories to its competitors, with a heavy emphasis on international news. For a brief time during the 1990s the paper was selling more than The Times, at 400,000 copies a day, but those heyday times are long gone. Now it barely has a tenth of that circulation. In many ways, it was lucky that the printed edition of the newspaper survived for as long as it did. The Independent was bought by Russian billionaire and former KGB agent Alexander Lebedev for just £1 in 2010. But despite innovations, such as going ‘tabloid’ and producing a smaller, sister paper called ‘i’ the tide could not be turned. Roy Greenslade, a former editor of the Daily Mirror and now a media commentator and journalism lecturer, said today that The Indie won’t be the only paper to fall. The ‘i’ newspaper has been sold to Johnston Press, and it’s planned that The Independent itself will continue as an online digital newspaper only. Owner Lebedev said today that The Independent’s last edition is expected to be on Saturday 26 March and the last Independent on Sunday is expected on Sunday 2 March. "We will be the first of many leading newspapers to embrace a wholly digital future. All of us are immensely proud of the Independent titles, which are better newspapers now than they have been for many years, thanks to your remarkable creativity, work ethic and passion. Ironically, earlier today and before the closure was announced, The Independent contacted me about my article that challenged Daily Express and Daily Mail reports that, "EU migrants are bringing the NHS to breaking point." The Deputy Editor of the Comment section wrote, “We'd be really interested in syndicating this article.” Not sure now if that’s going ahead. However, I do highly regard The Independent as representative of good and progressive journalism. When I was unwell and wrote about my long-road to diagnosis, it was only The Independent that offered to print my story just as I had written it, after I had to turn down The Times, that wanted to horribly sensationalise my story, and The Guardian, who sat on it for six months without any decision. For those of us campaigning for Britain to stay in the EU, for our government to do more to help refugees, and for a counter-balance to the chronic misreporting in tabloids such as the Daily Mail and The Sun, this is a sad day indeed, and the worst possible timing. With the EU referendum vote possibly happening in just a few months, the EU ‘Remain’ campaign has lost a voice that was on our side. Let’s hope that the digital version of the newspaper will somehow make up for it. Unlike the printed editions of The Independent, the digital edition is profitable and achieves 58 million readers a month. I do feel nostalgic. I have print in my veins; I love the smell of printers ink; the sound of the presses whirring; the feel of a paper as it comes off the rollers; the flipping through the pages... It is, though, time to more fully embrace the modern age, which it seems that The Independent is now doing. I am somewhat disappointed by the apparent cavalier way that the owners/managers of The Independent have handled the situation with the staff, by breaking the news so suddenly and without proper negotiations or preparation. That seems to be underhand and unnecessary, and not in line with the newspaper's style of journalism. I feel particularly concerned for the journalists and production staff at The Independent who will be losing their jobs. What future for them? And what future for journalism generally? Yes it is a very sad day.